Returning from an extended trip, we were so happy to be back in our beautiful mountains. As we entered the Narrows by the Dam Store, we were amazed at the type of fog: a warm mist, reminding us of the movie ET. Approaching our bridge, we found Jim and Marjie Stengel viewing the river upstream, from the very spot where D. R., as a boy, had fished with his father, with never a thought of a tragic upheaval. After a long visit, we drove into our garage. As we were unpacking, the phone rang. Stanley Frank called to warn us of reports he was hearing on his CB radio. While irrigating his farm, he was watching the black clouds hanging over Estes Park. Glancing out, we saw water trickling into our yard. D.R. thought the boards were not in the trout run, so he called John Ochsner and asked if he could help us. Both men knew well the power of water. Minutes later, I let the dogs in and noted water rising. I hurried to the pool terrace door, where the water was splashing on the glass. D.R. was then talking to Bill Griffing. At that moment, we heard the fire siren — only once. I looked for smoke down in the cove, as I always did when we heard the siren, and at that moment, the lights went out. Groping for candles and matches, I managed to put light into two rooms. Watching the rapid rise of the water, I shouted over the roar of the river, “the loft! ” “Of course, ” D. R. replied. Quickly I grabbed two heavy coats. D.R. took a little flashlight that worked only if you shook it, and we climbed the circular stairway to the loft and into a small bathroom, where we had put plumbing into an old steel-banded barrel. I said to D. R., “You hold onto one faucet and I will hold on to the other. If the water hits, the barrel will float. ” Every few minutes we would shine the dim light over the loft rail into the tack room below. Sushi, our little Australian shepherd, had disappeared. The old English sheepdog was swimming between floating couch cushions and table leaves. Determined to save him, I stood on the staircase, D.R. holding on to me, and was able to reach the hair on his head, holding tight while he made several attempts to secure a foothold on the slippery steps and pulled him up with us. “Dickens” sat between us, never blinking an eyelash: a bewildered look I shall never forget. He did not move, nor did we. How long we waited, we will never know. Soon the house gently rocked to the sound of shattering glass and splintering wood, a nightmare. By the Grace of God, we were pitched with the splitting boards toward the hillside. D.R. latched on to a piece of bearing beam. He held tight until I could work my one leg out from under the roof where it was trapped. Holding my hand, he threw his arm over the beam and we were flung into the wild current. 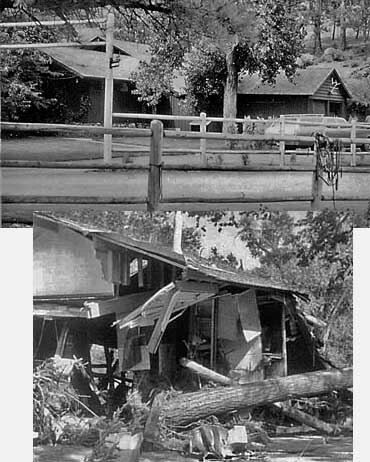 We were told that we went out in 19 feet of water as the flood crested at Cedar Cove at 9:20 p. m.
Tossing in the violent, churning current, our sense of survival took over. We tried desperately to catch willows on the bank, but a luminous, glowing slime prevented our holding on. Tossing about, as a ship in a storm, we missed the cattle chute and whirled on. Seemingly miles and hours, struggling and exhausted, I caught one leg in coaxial cable. Trying to remove it, I let go and was carried away in the raging current. I only remember going under, furiously treading water, catching D. R’s shirt sleeve with two fingers and holding his hand again. The next thing I felt was the “softest sand. 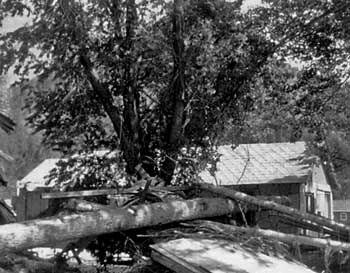 ” Pushing on this and over a high pile of debris, I found myself nearing the fork of an old elm tree. D.R. was in a little eddy trying to help me, which was not easily done, but somehow we found ourselves leaning against the huge limbs above the fork in the tree. We put our arms around each other and prayed. Weeks later we learned that the “soft sand” was our living room rug wrapped around the tree above the rubble. Still holding the little flashlight, D.R. would shine its faint beam to try to determine our location, never dreaming we were across from the Stengels in the tree Jim and Joe Weatherill had discussed cutting down. Jim Stengel, seeing an occasional faint light, told Marjie and Ann, “There’s someone in that tree. ” He didn’t see the light again and said that whoever had been in that tree was gone but he kept watching. The Stengels’ story tells the miraculous events that followed. 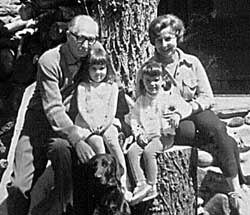 Margie and their daughter, Ann Berry, took over from the time Jim brought us to the bank and up the hill, where they had kept a fire burning and a pallet ready on the ground. They took off what clothing was left on us and found our bodies covered from one end to the other with what they called, “these little bitty twigs.” After drying us off, they dressed us in robes and covered us with blankets. It was after our rescue that the rain came to Cedar Cove. When the pilots of the helicopter came for us, I asked them to walk down in the Cove to Bill Griffing’s little stone house to see if he was still alive. Bill had been with D. R. for 35 years, and I wanted him to be with us. They found him standing in silt, his little black dog, “Back Here, ” beside him, and brought him to the helicopter where the pilots put me in the top litter, Bill in the middle and D. R. below. D.R. lovingly described him in his long underwear, his cane, bare feet, and black cowboy hat, which he was never without. We were taken to McKee Medical Center where D. R. and Bill were admitted. I asked to be taken to Ben and Marge Gregg’s home until our daughter and son-in-law came. They then took me back to McKee where “Flight-for-Life” flew us to St. Luke’s Hospital in Denver. Dr. Fred Schoonmaker, D.R. ’s cardiologist, was waiting for us on the Helipad. When Dr. Schoonmaker saw us in separate rooms, he hied himself down to the Administration office, saying, “After all these people have been through all night, you can’t separate them now.” We held the distinct honor of being the first married couple ever to be allowed to sleep in the same room in the old St. Luke’s Hospital, built in 1891. How blessed we were with family and friends who helped in every way possible. The morning after we were admitted to St. Luke’s in Denver, Bob Timothy walked in, holding two pairs of shoes for D. R. “All God’s chillen gotta have shoes. ” His wife Elaine and daughter Kristen followed with gown, robe, slippers and denim bag to carry them home. Sandy and her husband, Bob, followed with other necessities, as did our many friends. Bob and Nornie Colwell, who had made three trips to the Cove, surprised us with a family shower, where we started all over again. One of the most amazing calls came from Dianna Ruck, sister of Beverly Graham. I had not seen Diana in 20 years. Her dream of the angels, and Bob Graham’s poignant story of his great loss, have deeply touched us all. There were many things I remember from the days after the flood. My granddaughter, Jenny, picked up the small trout trapped in our creek bed and carried them to the river. How sweet, I thought. The big machines scooped up our belongings along with the mud and carried 60 years of remembrances off forever. Our bedroom was turned completely around, with one wall left standing. This held our daughter Sandy Olsen’s wedding picture, not a drop of water had touched the matte nor had it moved from its hanging wire. Pidge came to us, after we moved to Loveland — God’s gift to replace our lost pets. A croupy sound from the threshold of our back door caused alarm. There crouched a beautiful pigeon, a tumbler, cold and sick. D.R. had a little house built for him, which we put on top of the freezer in the garage. To the day we sent him to a ranch, he cooed to us, flew out to the street to meet us when we approached our driveway, followed us around, and was a precious pet. Having lost nearly everything we owned, our values of life certainly changed overnight. We had each other, our families and friends and their many blessings. I truly believe that we were saved for a purpose yet to be revealed. The miracle of surviving, at our age, is beyond all understanding. Memories fade, but the years of love and caring gave us courage to carry on. The awesome silence and beauty of the canyon has been restored once more. WOW! The survival tale is well worth being in print. The Big Thompson had always been a favorite drive to Estes from St. Louis that my mother enjoyed. It has found memories for me from an early age. Thank you Ginny Pullian. Site contents copyright © 2019 Recorder Online	except as noted. All rights reserved. | 88 queries in 1.168 seconds.